My practice values service to the community and often does workshops for scout groups. Sometimes we’re teaching essentials of CPR and sometimes it’s first aid. This weekend, I had the chance to help one of my partners put on a workshop for the Medicine merit badge for his son’s Boy Scout troop. He’s an official merit badge counselor and asked me to help a couple of months ago. My brother is an Eagle Scout, so I remembered seeing the merit badge booklets around the house and thinking that they had all kinds of interesting information. Apparently now they’re full color and you can also get electronic copies, so I was glad to see that scouting is keeping up with the times. When I finally hit the merit badge website Thursday night to prepare and cracked open the paper booklet, I noticed that the last update to the book was 2002 (although the website mentioned that the requirements were updated in 2005). I figured I’d be in for some entertainment as I read about how medicine was portrayed to scouts 15 years ago. I was surprised, though, with how well the materials have held up. The healthcare professionals portrayed in the booklet represent a diverse workforce and are filling a variety of roles in medicine. I realized as I was reading that much of the information provided should be required reading for people entering medical fields or for people who want to better understand the medical people they work with. Game time came too quickly for someone who had procrastinated their preparation. I found myself Saturday morning in our break room in front of a group of teenagers eager to show their knowledge medicine. During the first part of the requirements, the scout has to do a great deal of research on historical medical figures – individuals like Hippocrates, Florence Nightingale, Louis Pasteur, Jonas Salk, Marie Curie, and more. I was impressed by the boys’ ability not only to throw out interesting facts about their subjects, but to talk about why those contributions are important to healthcare even today. (A note to the Boy Scouts: if you consider updating this, let’s think about throwing in Larry Weed for his contributions to patient care and healthcare IT). We next moved into my part of the morning, which was to teach the boys how to take a pulse and perform a blood pressure measurement. I was quickly cast aside by an older scout who asked if he could teach the group because he had volunteered at a blood pressure screening. I’m not sure why I was even there (other than to prevent them from doing goofy things with the blood pressure cuffs, which may or may not have happened) because the scout did a great job using the EDGE method, which includes explaining, demonstrating, guiding the student, and enabling their success. Since I spend a great deal of my time dealing with processes that have gone wrong, it was so gratifying to see a teenager taking charge and getting things done. Frankly, he was a better teacher / trainer than some of the folks I work with on a daily basis. I suspect that he is going to have a great future regardless of the field he chooses. I was also tasked with talking to them about the instruments we use in the office, including EKG machines, pulse oximeters, spirometers, and more. We talked a little about electronic health records and how information sharing works in healthcare today, and I gave a little plug for careers in healthcare IT. I don’t think any of them had ever been exposed to a clinical informaticist before (not that I would expect them to have been) and I could see a couple of the boys perk up when we started talking about the technology. They perked up the most when we talked about defibrillating people and what that process actually entails. The drama of shouting “clear” and shooting electricity through someone’s body is well-portrayed on TV and they were definitely interested in learning more about it. Another requirement is for the boys to discuss what makes a good screening test and why tests aren’t always perfect. Listening to them tell me about specificity and sensitivity and how patients had to be informed consumers so they didn’t spend a lot of money on tests that wouldn’t do them any good truly warmed my heart. These kids are clearly growing up in a world where being an informed patient is going to be critical to staying healthy and they were embracing it. They branched off into a little discussion on the Affordable Care Act and how people didn’t understand that it was the same thing as Obamacare and why it was a mess. I knew these kids would be informed (one of the other requirements is to research the healthcare delivery systems in Sweden and China and compare them to the United States health system) but I was impressed. I know some of them have been working with my partner individually on the requirements, but they’ve clearly done their research. 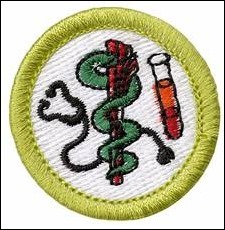 The badge also requires the scout to discuss the roles of medical societies, the government, and the insurance industry in how they influence the practice of medicine in the US. From the presentation one of the scouts gave, I suspected we had a ringer in the group who had a physician in the family. It turns out that his mom is a family medicine physician, and he talked about how much his mom’s group struggles with Meaningful Use and other programs. That was an eye-opener for some of the other boys, whose only exposure to healthcare may have been at their own doctor’s office or through what they had read in the merit badge booklet and at our workshop. They also have to explain how their state monitors healthcare quality and how it provides care to patients who don’t have insurance. These are pretty deep subjects for the average adult, let alone for a 12-18 year old boy, and I was impressed by the fact that the badge dug into it. The boys also had to present on different types of healthcare providers along with their training and educational requirements, as well as different subspecialties and what it takes to become a physician in those disciplines. It was entertaining to hear what the boys thought some of the specialties do vs. what we actually do – paperwork and charting were never mentioned in any of their synopses. The scouts also had to research the Hippocratic Oath and explain it, along with comparing the original to a more modern version. They had to “discuss to whom those subscribing to the original version of the oath owe the greatest allegiance” (for those of you who haven’t read it lately, it’s not the patient). That led to a discussion of the patient-physician relationship and how it’s important in delivering quality care. We also discussed the role of patient confidentiality and HIPAA. A couple of the boys in the group are 17 and will be adults soon, so I was able to talk to them a little about deciding whether to include their patients to be able to receive information when they go to the doctor and who they would want to make decisions for them in the event that they couldn’t. These are topics that most parents don’t cover with their young adults before they head off to college. It was a little bit outside of requirements, but it was a valuable discussion. The scouts also have to volunteer at a health-related event in the community that they’ve had approved by my partner. Some of them have already done their volunteer work and it was interesting to hear what they did – handing out health flyers at a community event, volunteering at a free clinic, and working as a teen aide at the hospital. A couple more are planning to work at an upcoming blood drive and then they’ll be able to earn their badges. Looking at the information they had to explain, discuss, and tell about during the workshop (more than an hour and a half of discussion for each scout) plus the additional research to prepare for their presentations and the documentation they all brought, it seems like this might be one of the more intense merit badges the boys are exposed to. According to my partner, the Public Health merit badge has even more requirements. It was exciting to see the leaders of tomorrow motivated to learn about our field and willing to spend time serving their community. It gives me hope that even as complicated as healthcare is, we have bright young people eager to try to figure out the best ways to serve patients in the coming decades. Have you talked to young people about your career in healthcare IT? Email me.